^ Wolfram, Stephen (1983). “Statistical Mechanics of Cellular Automata”. Reviews of Modern Physics 55 (3): 601–644. Bibcode: 1983RvMP...55..601W. doi:10.1103/RevModPhys.55.601. http://www.stephenwolfram.com/publications/articles/ca/83-statistical/. ^ Pickover, Clifford A. (2009). The Math Book: From Pythagoras to the 57th Dimension, 250 Milestones in the History of Mathematics. Sterling Publishing Company, Inc. p. 406. ISBN 978-1402757969. ^ John von Neumann, “The general and logical theory of automata,” in L.A. Jeffress, ed., Cerebral Mechanisms in Behavior – The Hixon Symposium, John Wiley & Sons, New York, 1951, pp. 1-31. ^ John G. Kemeny, “Man viewed as a machine,” Sci. Amer. 192(April 1955):58-67; Sci. Amer. 192(June 1955):6 (errata). ^ von Neumann, John; Burks, Arthur W. (1966). Theory of Self-Reproducing Automata. University of Illinois Press. ^ Wiener, N.; Rosenblueth, A. (1946). “The mathematical formulation of the problem of conduction of impulses in a network of connected excitable elements, specifically in cardiac muscle”. Arch. Inst. Cardiol. México 16: 205. ^ Davidenko, J. M.; Pertsov, A. V.; Salomonsz, R.; Baxter, W.; Jalife, J. (1992). “Stationary and drifting spiral waves of excitation in isolated cardiac muscle”. Nature 355 (6358): 349–351. Bibcode: 1992Natur.355..349D. doi:10.1038/355349a0. PMID 1731248. ^ Hedlund, G. A. (1969). “Endomorphisms and automorphisms of the shift dynamical system”. Math. Systems Theory 3 (4): 320–3751. doi:10.1007/BF01691062. http://www.springerlink.com/content/k62915l862l30377/. ^ Gardner, Martin (1970). “Mathematical Games: The fantastic combinations of John Conway's new solitaire game "life"”. Scientific American (223): 120–123. http://www.ibiblio.org/lifepatterns/october1970.html. ^ Zenil, Hector (2010). “Compression-based investigation of the dynamical properties of cellular automata and other systems”. Complex Systems 19 (1). http://www.complex-systems.com/pdf/19-1-1.pdf. ^ G. Cattaneo, E. Formenti, L. Margara (1998). “Topological chaos and CA”. In M. Delorme, J. Mazoyer. Cellular automata: a parallel model. Springer. p. 239. ISBN 978-0-7923-5493-2. http://books.google.com/books?id=dGs87s5Pft0C&pg=PA239. ^ Burton H. Voorhees (1996). 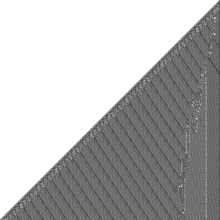 Computational analysis of one-dimensional cellular automata. World Scientific. p. 8. ISBN 978-981-02-2221-5. http://books.google.com/books?id=WcZTQHPrG68C&pg=PA8. ^ Max Garzon (1995). Models of massive parallelism: analysis of cellular automata and neural networks. Springer. p. 149. ISBN 978-3-540-56149-1. ^ Richardson, D. (1972). “Tessellations with local transformations”. J. Computer System Sci. 6 (5): 373–388. doi:10.1016/S0022-0000(72)80009-6. ^ Margenstern, Maurice (2007). Cellular Automata in Hyperbolic Spaces - Tome I, Volume 1. Archives contemporaines. p. 134. ISBN 978-2-84703-033-4. http://books.google.com/books?id=wGjX1PpFqjAC&pg=PA134. ^ Sutner, Klaus (1991). “De Bruijn Graphs and Linear Cellular Automata”. Complex Systems 5: 19–30. http://www.complex-systems.com/pdf/05-1-3.pdf. ^ Kari, Jarkko (1990). “Reversibility of 2D cellular automata is undecidable”. Physica D 45: 379–385. Bibcode: 1990PhyD...45..379K. doi:10.1016/0167-2789(90)90195-U. ^ Kari, Jarkko (1999). “On the circuit depth of structurally reversible cellular automata”. Fundamenta Informaticae 38: 93–107. ^ Durand-Lose, Jérôme (2001). “Representing reversible cellular automata with reversible block cellular automata”. Discrete Mathematics and Theoretical Computer Science AA: 145–154. ^ a b Ilachinski, Andrew (2001). Cellular automata: a discrete universe. World Scientific. pp. 44–45. ISBN 978-981-238-183-5. http://books.google.com/books?id=3Hx2lx_pEF8C&pg=PA4. ^ Murray, J.. Mathematical Biology II. Springer. ^ Giles, Jim (2002). “What Kind of Science is This?”. ネイチャー (417): 216–218. ^ Weinberg, Steven (October 24, 2002). “Is the Universe a Computer?”. The New York Review of Books (Rea S. Hederman). http://www.nybooks.com/articles/archives/2002/oct/24/is-the-universe-a-computer/?pagination=false 2012年10月12日閲覧。. ^ Peak, West; Messinger, Mott (2004). “Evidence for complex, collective dynamics and emergent, distributed computation in plants”. Proceedings of the National Institute of Science of the USA 101 (4): 918–922. Bibcode: 2004PNAS..101..918P. doi:10.1073/pnas.0307811100. PMC: 327117. PMID 14732685. http://www.pnas.org/cgi/content/abstract/101/4/918. ^ Yves Bouligand (1986). Disordered Systems and Biological Organization. pp. 374–375. ^ A. K. Dewdney, The hodgepodge machine makes waves, Scientific American, p. 104, August 1988. ^ M. Gerhardt and H. Schuster, A cellular automaton describing the formation of spatially ordered structures in chemical systems, Physica D 36, 209-221, 1989. ^ Tomassini, M.; Sipper, M.; Perrenoud, M. (2000). “On the generation of high-quality random numbers by two-dimensional cellular automata”. IEEE Transactions on Computers 49 (10): 1146–1151. ^ Wolfram, S. "Cryptography with Cellular Automata", In Advances in Cryptology: CRYPTO '85 Proceedings [Williams, H. C. (Ed.)]. Lecture Notes in Computer Science 218. Springer-Verlag, 429–432, 1986. ^ "Cellular Automaton Public-Key Cryptosystem", Complex Systems, Vol. 1, No. 1 (1987). ^ J. P. Crutchfield, "The Calculi of Emergence: Computation, Dynamics, and Induction", Physica D 75, 11-54, 1994. ^ M. Minsky, "Cellular Vacuum", International Journal of Theoretical Physics 21, 537-551, 1982. ^ K. Zuse, "The Computing Universe", Int. Jour. of Theo. Phy. 21, 589-600, 1982. ^ Blackford, Russell; Ikin, Van; McMullen, Sean (1999). “Greg Egan”. Strange constellations: a history of Australian science fiction. Contributions to the study of science fiction and fantasy. 80. Greenwood Publishing Group. pp. 190–200. ISBN 978-0-313-25112-2. ^ Hayles, N. Katherine (2005). “Subjective cosmology and the regime of computation: intermediation in Greg Egan's fiction”. My mother was a computer: digital subjects and literary texts. University of Chicago Press. pp. 214–240. ISBN 978-0-226-32147-9. Bialynicki-Birula, Iwo; Bialynicka-Birula, Iwona (2004). Modeling Reality: How Computers Mirror Life. Oxford University Press. ISBN 0198531001. Chopard, Bastien; Droz, Michel (2005). Cellular Automata Modeling of Physical Systems. Cambridge University Press. ISBN 0-521-46168-5. Gutowitz, Howard, ed (1991). Cellular Automata: Theory and Experiment. MIT Press. ISBN 9780262570862. Ilachinski, Andrew (2001). Cellular Automata: A Discrete Universe. World Scientific. ISBN 9789812381835. Kier, Lemont B.; Seybold, Paul G.; Cheng, Chao-Kun (2005). Modeling Chemical Systems using Cellular Automata. Springer. ISBN 9781402036576. Schiff, Joel L. (2011). Cellular Automata: A Discrete View of the World. Wiley & Sons, Inc. ISBN 9781118030639. Wolfram, Stephen (2002). A New Kind of Science. Wolfram Media. ISBN 978-1579550080. Barral, Bernard; Chaté, Hugues; Manneville, Paul (1992). “Collective behaviors in a family of high-dimensional cellular automata”. Physics Letters A 163 (4): 279–285. doi:10.1016/0375-9601(92)91013-H.
A. D. Wissner-Gross. 2007. Pattern formation without favored local interactions, Journal of Cellular Automata 4, 27-36 (2008). von Neumann, John, 1966, The Theory of Self-reproducing Automata, A. Burks, ed., Univ. of Illinois Press, Urbana, IL. Wolfram, Stephen, 1985, Cryptography with Cellular Automata, CRYPTO'85. Ganguly, Sikdar, Deutsch and Chaudhuri "A Survey on Cellular Automata"
Klaus Sutner. 1989. A Note on Culik-Yu Classes Complex Systems 3 (1989) 107-115.